The second in a twelve part documentary series profiling world leaders, 'The Price Of Kings - Shimon Peres' is an appropriate complement to the series opener, 'The Price Of Kings - Yasser Arafat'. The two documentaries, narrated by Helena Bonham-Carter, intertwine their stories of the Middle East peace process, the latest film understandably focussing more on the perspective of Peres, the current President of Israel. Directors Joanna Natasegara and Richard Symons once again combine on 'The Price Of Kings - Shimon Peres', examining the inception of the state of Israel, along with its concurrent conflict with Palestine. Peres has played a pivotal role politically over the last sixty years, becoming Prime Minister of Israel twice before his current role. Using archive footage and interviews from a variety of commentators and close associates, including President Peres himself, 'The Price Of Kings - Shimon Peres' both explores the wider context of his political career as well as constructing a personal narrative for Peres. The documentary takes a rather unashamedly Israeli perspective, particularly in relation to the more measured first installment. Many of the Palestinian concessions that were covered in the Arafat documentary are not seen here, all the more surprising considering the overlap of the two films, sharing most of the same interviewees. Indeed, the views given on Peres are almost exclusively from Israelis, although admittedly the opinions of the leader presented given are often forthright - both in terms of praise and also vehement criticism. 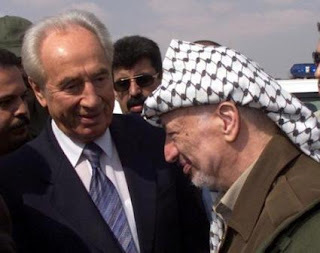 The film covers Peres' long-standing political marginalisation, largely due to his lack of frontline military action, but equally for his drive for peace - Peres was awarded a Nobel Peace Prize a decade ago, along with then Israeli Prime Minister Yitzhak Rabin and then Palestinian leader, Yasser Arafat. That process was scuppered at least partly due to the assassination of Rabin, one of the few high-profile proponents of Israeli-Arab peace in the Israeli government, and has never quite recovered since. It is only in Shimon Peres' role as President, that he has finally found favour with the majority of his fellow country people. Having put his nation's best interests ahead of his own for so much of his career, it appears that Peres does not wish to jeopardise his new found popularity in order to once again move forward the Middle East peace process. The insight of 'The Price Of Kings - Shimon Peres' makes it difficult to begrudge the behaviour of Peres - instead we must hope he again makes sacrifices to better the future for others. For more info and to purchase the DVD, head to priceofkings.co.uk.